While in midst of the holiday clean up, I noticed this paper.. it was Christmas paper, which I had trimmed to two sizes, and then obviously didn't use it in the means in which I wanted at that time. It didn't take me long to gather up the pieces, some Crumb Cake cardstock and through a ribbon together and get that Island Floral die out and rip out a flower! I cut out four Cherry Cobbler Floral flowers, spritzed and mashed them. Along with a Artichoke leave. That I sponged with Chocolate Chip before smashing. While waiting for that to dry, I used the 5 petal punch and then the owl punch for the yellow center. 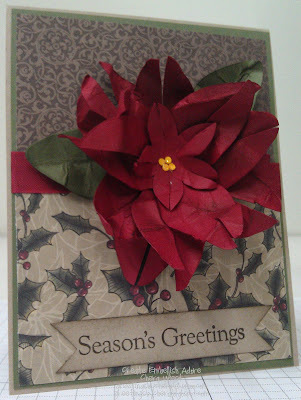 This card was almost together and it wasn't more than 15 minutes from finding my already cut pieces. I reached for the Four the Seasons stamp, used the Espresso ink and then cute the ends with a square punch. I used my bone scorer to loosen the fibers and then attached the sentiment near the bottom of the card. I used my Tombow glue to connect the flowers, alternating the leaves, and poofed it up. Crunched the flowers accordingly. I love it ! Its my favorite, and I made three more!!! Of course, I used different sides of the paper for different effect. I will just have to figure out how to get these little big guys in an envelope! That poinsettia is beautiful, love it!